The Brahmanas (/ˈbrɑːmənə/; Sanskrit: ब्राह्मणम्, Brāhmaṇa), also known as the Brahmana Granthas are a collection of ancient Indian texts with commentaries on the hymns of the four Vedas. They are primarily a digest incorporating myths, legends, the explanation of Vedic rituals and in some cases philosophy. They are attached to each Veda, and form a part of the Hindu śruti literature. Each Vedic shakha (school) has its own Brahmana, many of which have been lost. A total of 19 Brahmanas are extant at least in their entirety: two associated with the Rigveda, six with the Yajurveda, ten with the Samaveda and one with the Atharvaveda. Additionally, there are a handful of fragmentarily preserved texts. They vary greatly in length; the edition of the Shatapatha Brahmana fills five volumes of the Sacred Books of the East. 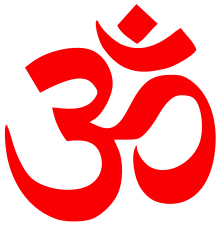 The Brahmanas were seminal in the development of later Indian thought and scholarship, including Hindu philosophy, predecessors of Vedanta, law, astronomy, geometry, linguistics (Pāṇini), the concept of Karma, or the stages in life such as brahmacarya, grihastha, vanaprastha and eventually, sannyasa. Brahmanas also lack a homogeneous structure across the different Vedas, with some containing sections that are Aranyakas or Upanishads in their own right. The language of the Brahmanas is a separate stage of Vedic Sanskrit, younger than the text of the samhitas (the mantra texts of the Vedas proper), ca.1000BCE, but for the most part are older than the text of the Sutras. The dating of the Brahmanas is controversial, with oldest being dated to about 900 BCE, while the youngest Brahmanas (such as the Shatapatha Brahmana), were complete by about 700 BCE. Taittiriya Samhita (TS). In addition to the Brahmana style portions of the Samhita,the Taittiriya school has an additional Taittiriya Brahmana (TB) and Aranyaka (TA) as well as the late Vedic Vadhula Anvakhyana (Br.). It includes a description of symbolic sacrifices, where meditation substitutes an actual sacrifice. 1 2 Michael Witzel, "Tracing the Vedic dialects" in Dialectes dans les litteratures Indo-Aryennes ed. Caillat, Paris, 1989, 97–265. ↑ "Vedic Samhitas and Brahmanas – A popular, brief introduction". Arthur Anthony Macdonell (1900). "Brāhmaṇas". A History of Sanskrit Literature. New York: D. Appleton and company.